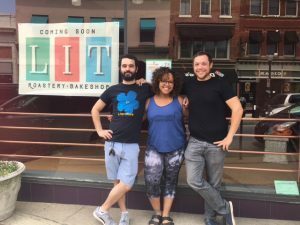 There’s a new coffee roaster and bakeshop slated to open in southside Bethlehem named Lit. We recently chatted with partner Matthew Hengeveld to find out more about what they’ll be serving up when they open in fall. 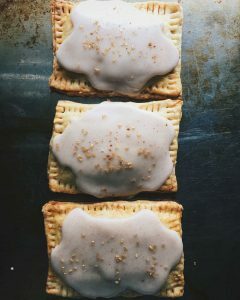 Located at the former Tallarico’s Chocolates space at 26 E 3rd St, the business is a collaboration between Monocacy Coffee Company, a Bethlehem-based specialty coffee roasting company, and Made by Lino bakery, brainchild of baker Melanie Lino. The shop will be a ‘co-retail’ space between the two companies, a separate company that will open up th e possibility of stocking other local goods down the road. Hengeveld and his co-owner of Monocacy, Dan Taylor, were old friends who eventually reconnected over a shared love of coffee. Hengeveld’s first foray into the specialty coffee world was at Ultimo Coffee in Philadelphia, while Taylor’s love with the brew started at Square One coffee in Lancaster. 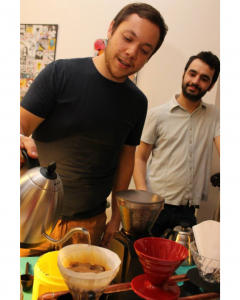 After Hengeveld started roasting his own beans at home, Taylor, not knowing that his future partner had become a coffee fanatic, happened to reach out to him about starting a coffee shop. Less than two years later they’re running a successful roasting business and are now opening their collaboration space with Made by Lino. In addition to Lino’s pastries, Monocacy will be of course roasting and selling coffee out of the shop. “Having a shop of our own grants both our companies opportunities we haven’t yet had,” noted Hengeveld. They plan to roast new coffees that they haven’t yet had an opportunity to work with, including beans from far-off areas in Guatemala, Ethiopia, Colombia, and other countries. His said he thinks “folks drinking big chain coffee will be blown away.” We’ve had his coffee, both brewed by Monocacy and at home after picking it up at the Bethlehem Visitor’s Center, and he’s not overselling. Of their location, Hengeveld said that while the area has a “rugged” reputation, it spoke to them as a spot that they could become part of the fabric of the community. After working at a local music publication for half a decade on Bethlehem’s southside, he noted that “it’s no Cinderella’s Castle,” but when presented with the possibility of opening in the area, he thought about some of his neighbor’s living in cramped apartments with little privacy and nowhere to go, sit, think, read, and relax. He envisions Lit as a spot where his southside neighbors can go to do those things. Lit is slated for a no-frills opening in mid-fall and are planning to be open from 7am to 7pm Tuesday-Saturday. You can follow their progress on Instagram at @lit610 and check out both businesses at @monocacycoffeeco and @madebylino.